We start auctions on eBay for vintage glass and porcelain from time to time for promotional purposes. The auctions last for a week or ten days. This listing catalogues all of our current and pending auctions. You may stop the auction 24 hours or more before it is due to end by buying the items below and the auction on eBay will then be ended. Swansea porcelain 'duck egg' dessert plate, painted in bright enamels probably by Henry Morris, floral sprays around a shallow well. 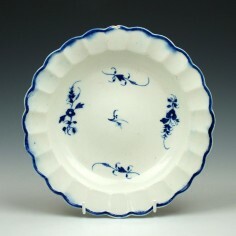 Caughley porcelain plate decorated in the Chantilly sprigs pattern.